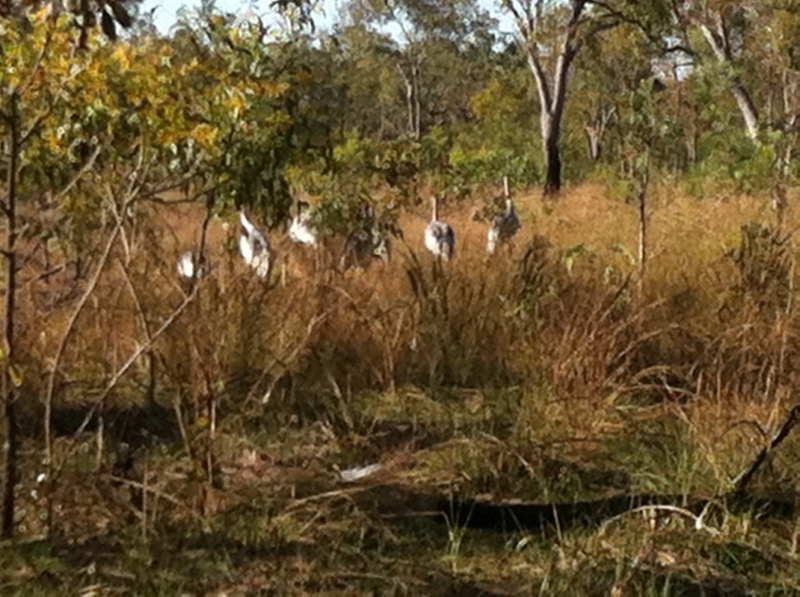 The next morning whilst eating breakfast seven brolgas flew down to the creek edge near camp and fossicked for their breakfast before flying off. We grabbed the camera ran over for a closer look at these beautiful majestic birds then as quickly as they arrived they flew away. 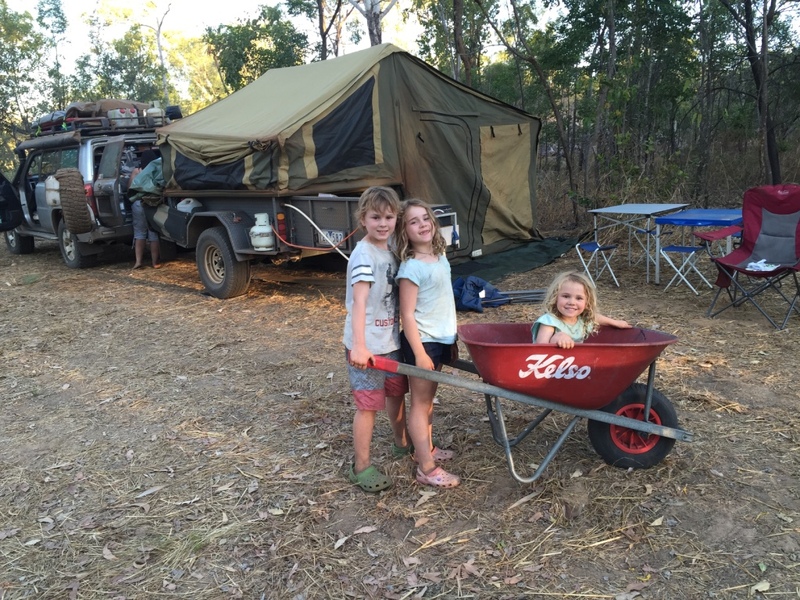 We were really tempted to stay another night at Pearson’s Creek so with reluctance we packed camp and continued along the track. 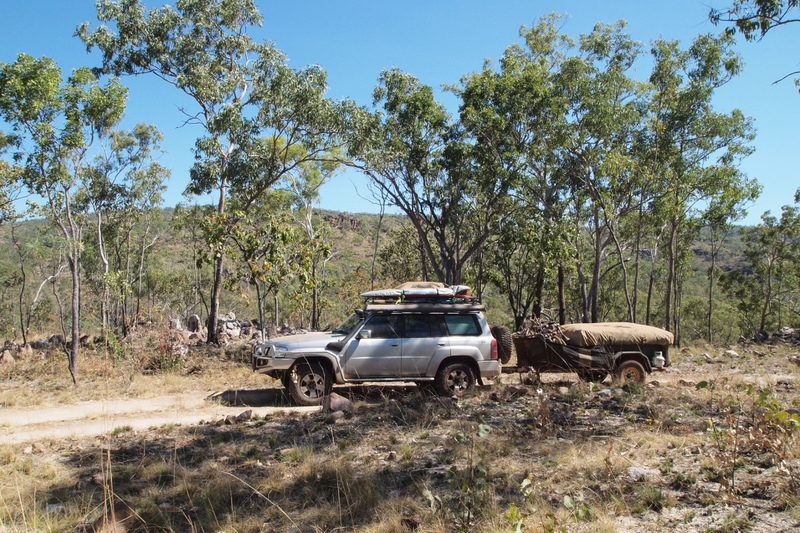 As we travelled along the bush as it changed from woodlands to pandanus forests. The track continued to be rough and slow but we all enjoyed the scenery. Aaron was snapping photos on his iPhone and bird spotting out the window and the girls played games together. Andrew was happy to be off road! 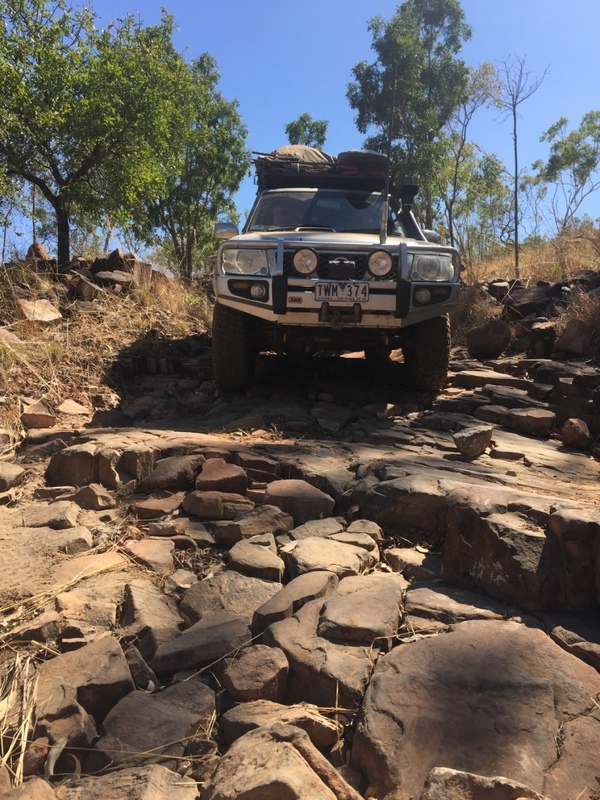 its rocky country and the track is rocky too! 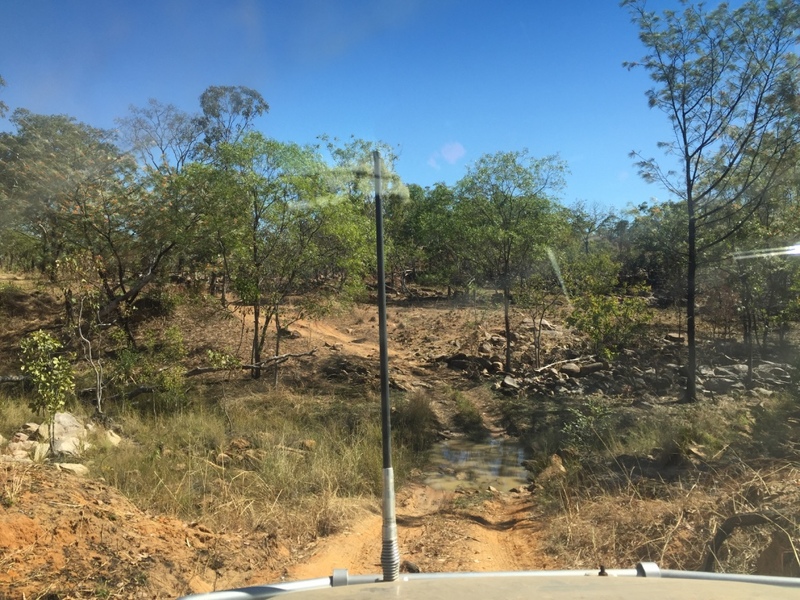 After a couple more rocky ‘jump-ups’ on the track and some deep sandy creek crossings we arrived at Bachsten Camp and we were warmly greeted by the camp hosts, Janet and Peter. 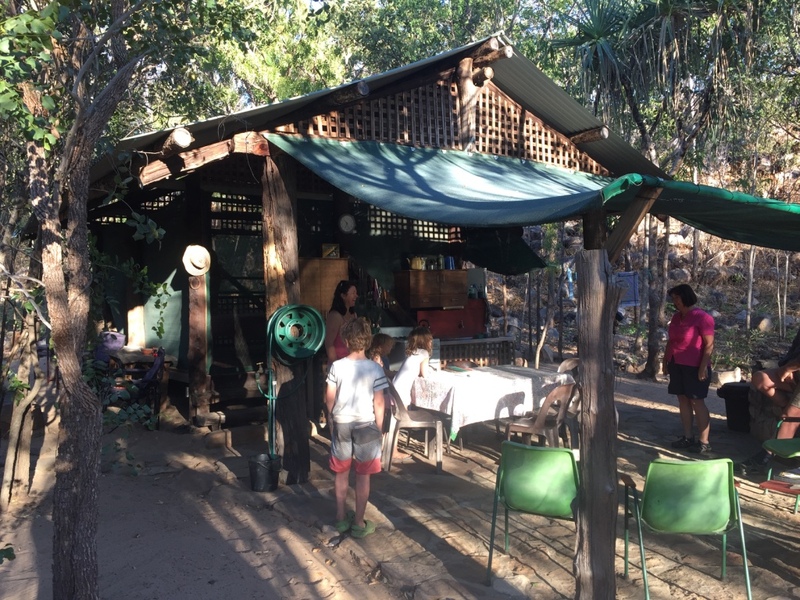 Bachsten Camp has only a handful of bushy camps, flushing loos (always a crowd pleaser), a donkey shower(an old wood fired hot water system) and fireplaces for each camp with cut firewood delivered to each camp. This place had a great welcome and feel. 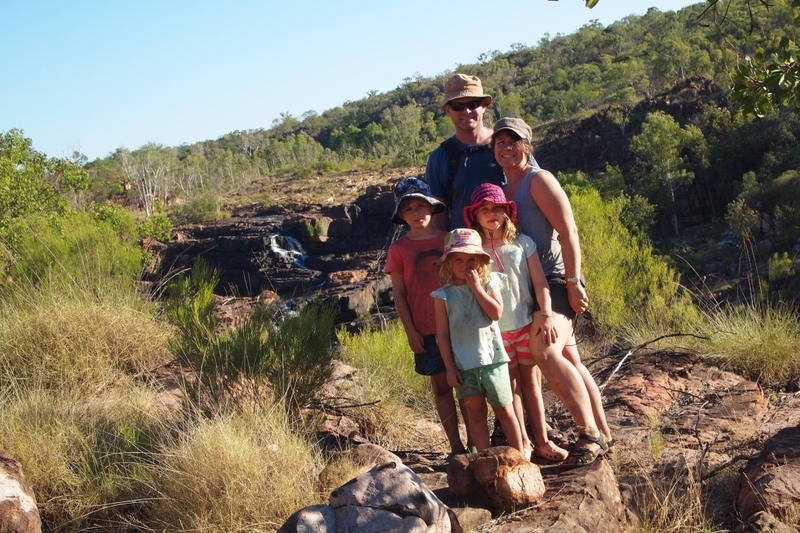 After a quick lunch we set off for an afternoon walk to Bachsten Falls on a loop that went to a lookout then across to the top of the falls however the walk took longer than anticipated, it was hot and both Holly and Bianca were a little tired. We arrived at the lookout at 4.15 and with oby an hour of daylight left we decided to head back the way we had come rather than risk walking in the dark. The sun sets at 5.15pm and it gets dark fairly quickly. 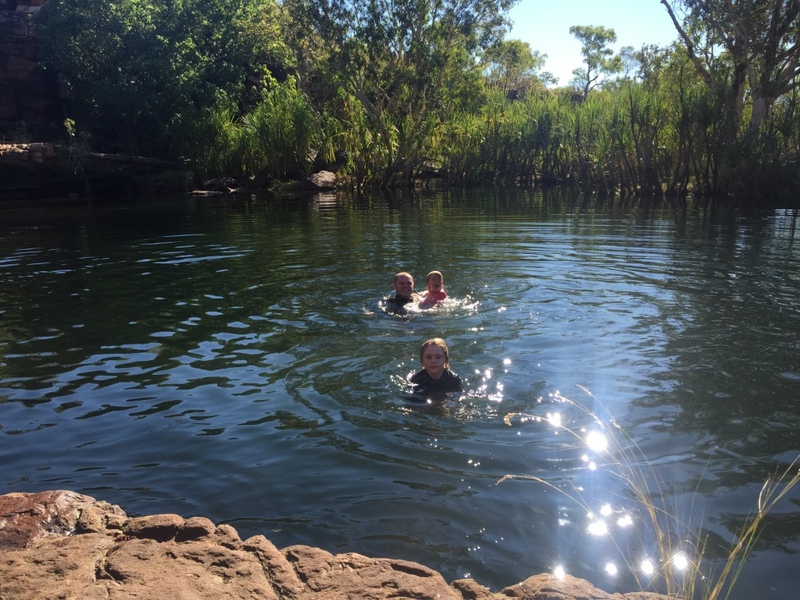 So we walked back to camp and managed to get back (down hill) faster so we able to have a quick dip in the river swim hole next to camp. Not long after we arrived back to camp and showered under the hot donkey Janet delivered a loaf of freshly baked bread. We all enjoyed warm butter bread. Fresh bread in the outback is a big treat as from Broome and all across the top we had only been able to buy frozen ‘fresh’ bread. 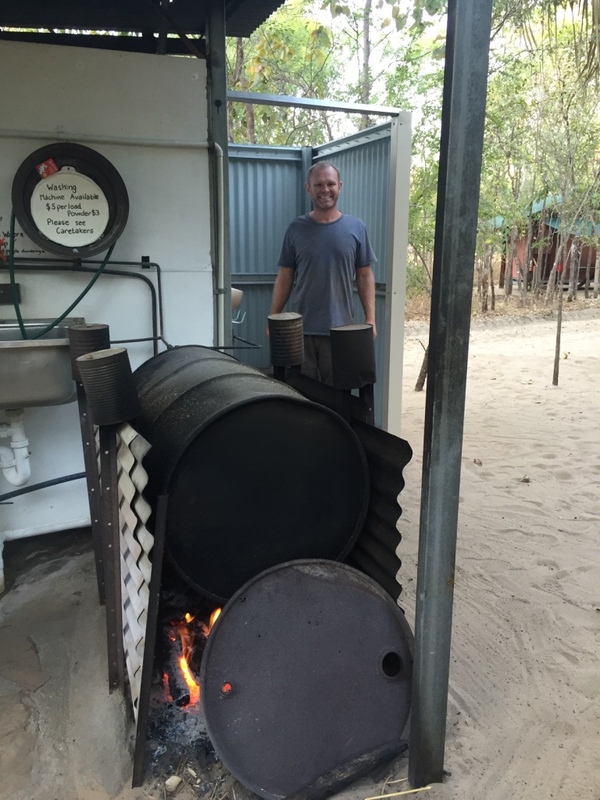 Whilst at Bachsten we cooked everything on the fire to conserve our gas supplies – we don’t usually cook on the fire and we found it really enjoyable and surprisingly easy. Aaron loved the responsibility of getting the fire started and keeping it stoked. 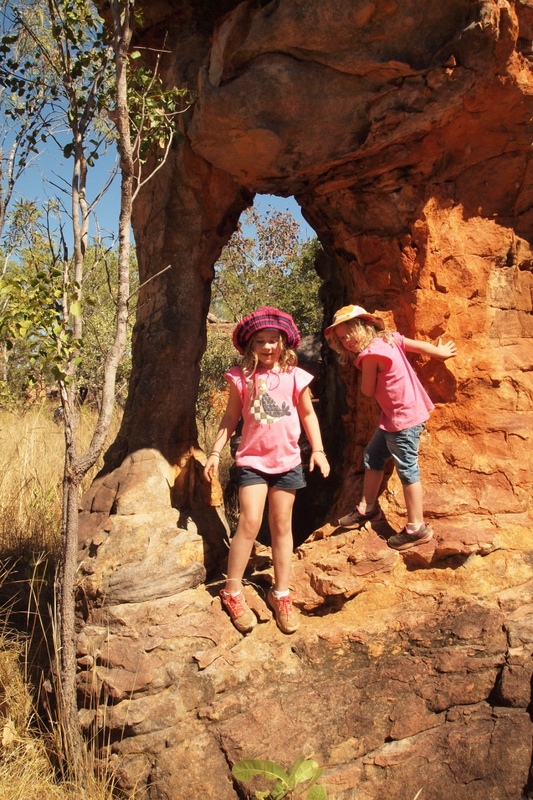 The next day we set off to explore the sandstone caves on the hill above camp. 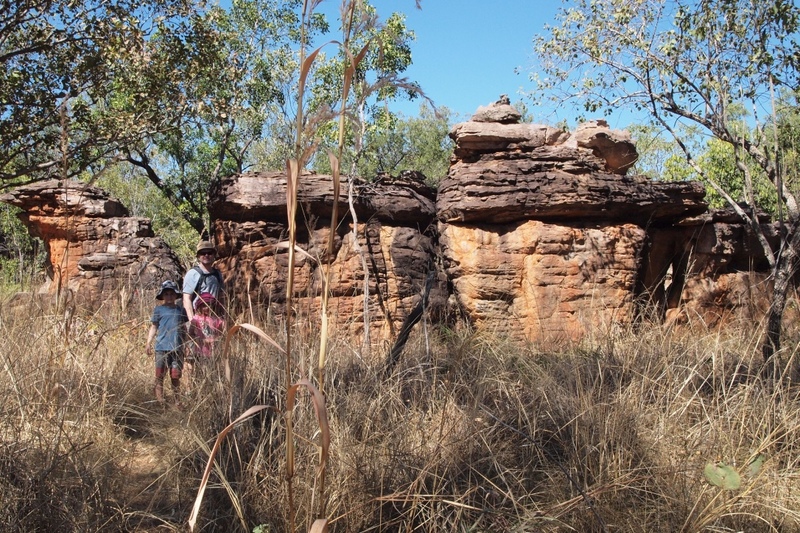 Called the ‘honeycomb caves’ these caves are believed to be inhabited by indigenous families as recently as the 1970’s. 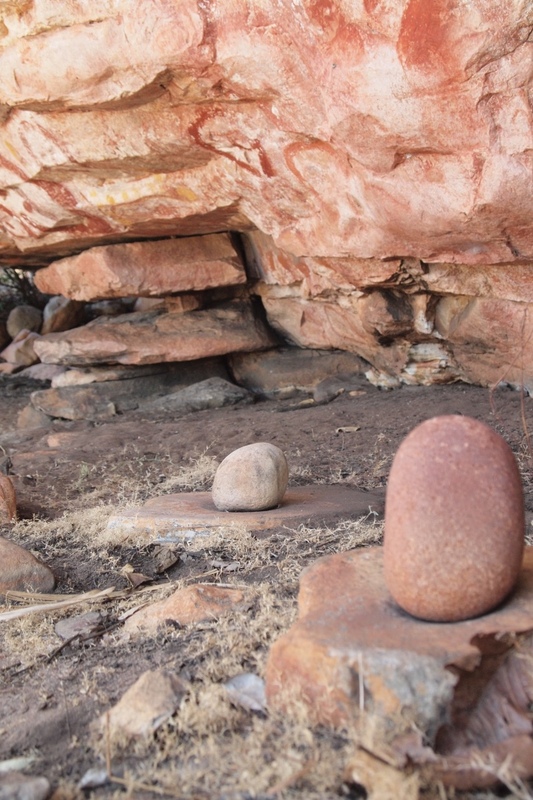 The area had many caves and rock formations which were easy to imagine being used for shelter from the heat and the rain. 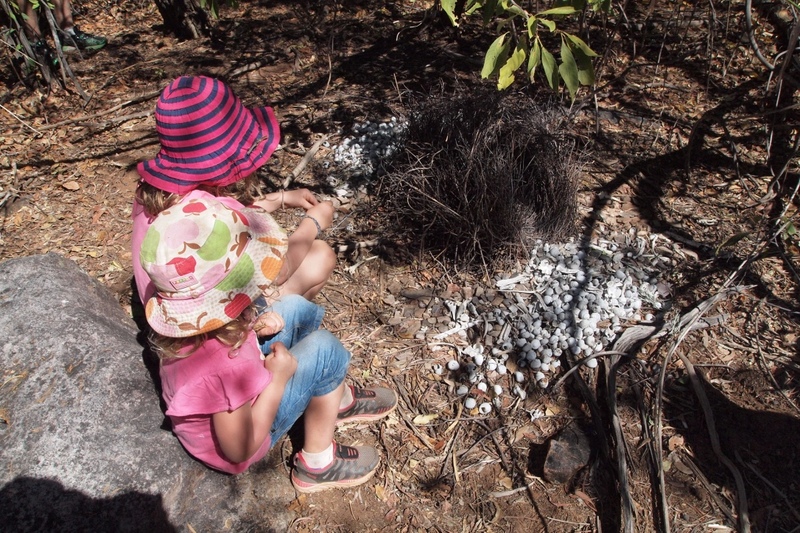 Whilst climbing around we found a bower bird’s nest with his collection of white rocks, bones, shells and objects – the northern bower birds are white and therefore collect white items unlike the southern cousins who collect blue. 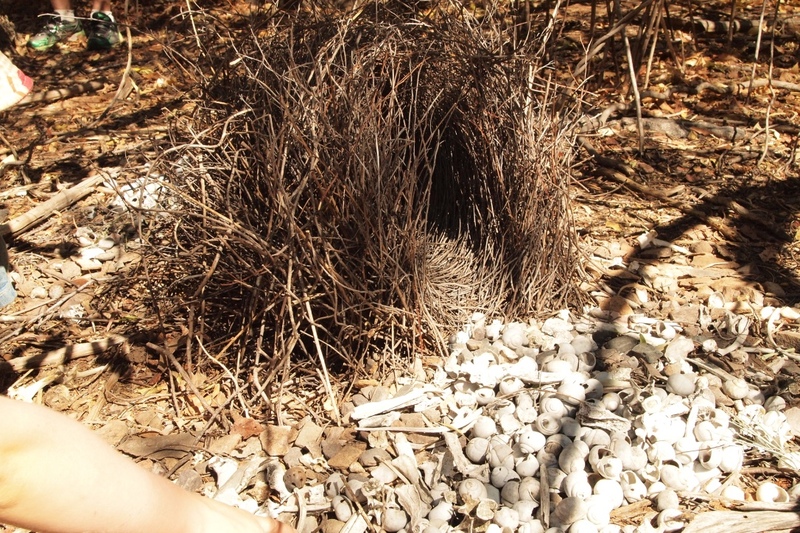 Bower bird nest up close..treasure. 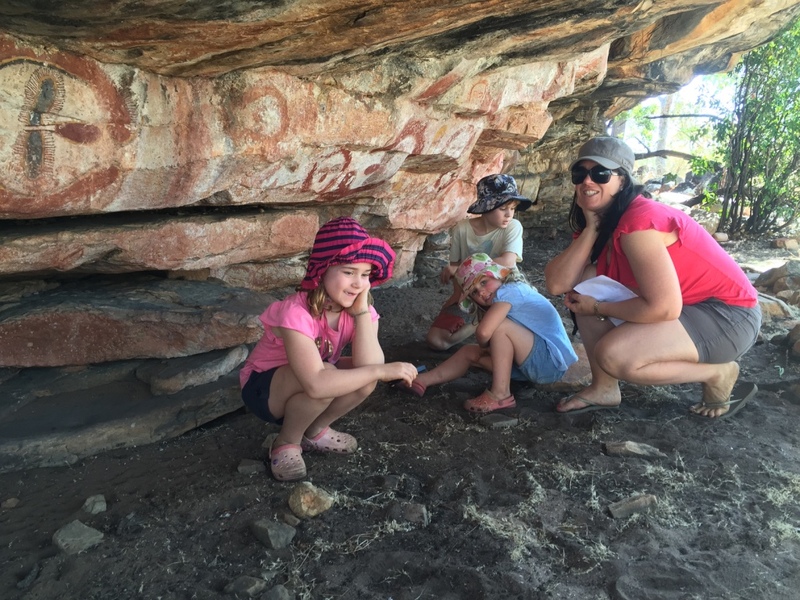 With the help of Peter and Linda we found a very special cave which had grinding stones left in position for the next inhabitant to come and move in. 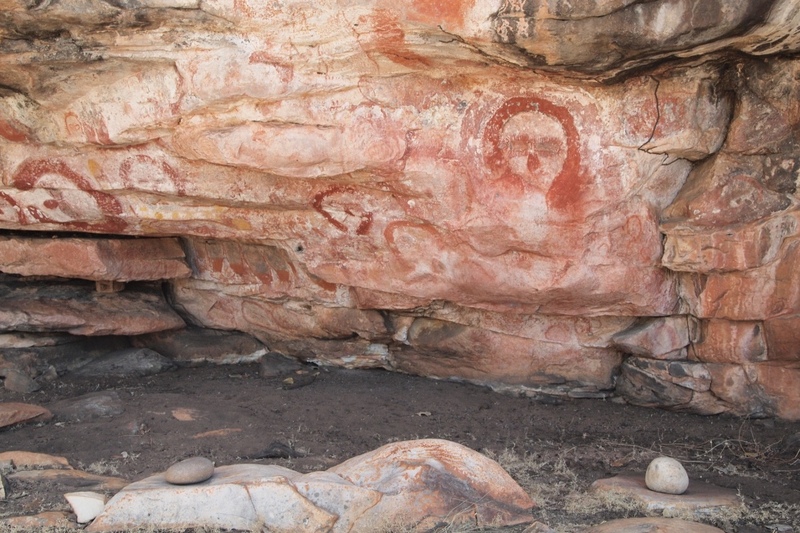 The caves also had some beautiful rock art of animals and Wandjina. 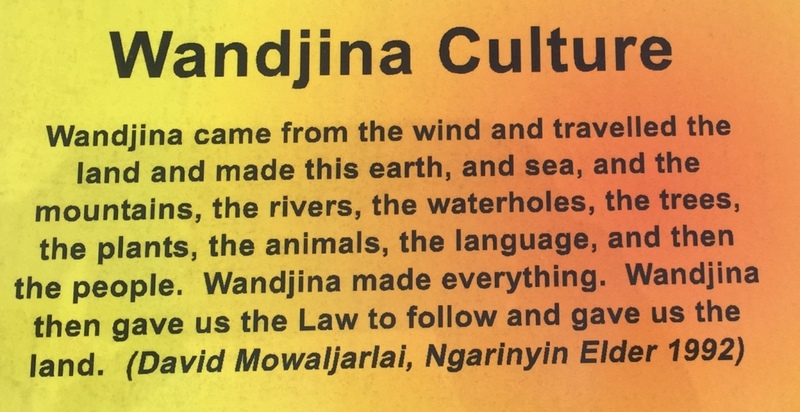 As we had learned the indigenous believed that Wandjina was a creation spirit provided everything. We knew we were visiting a very special place. 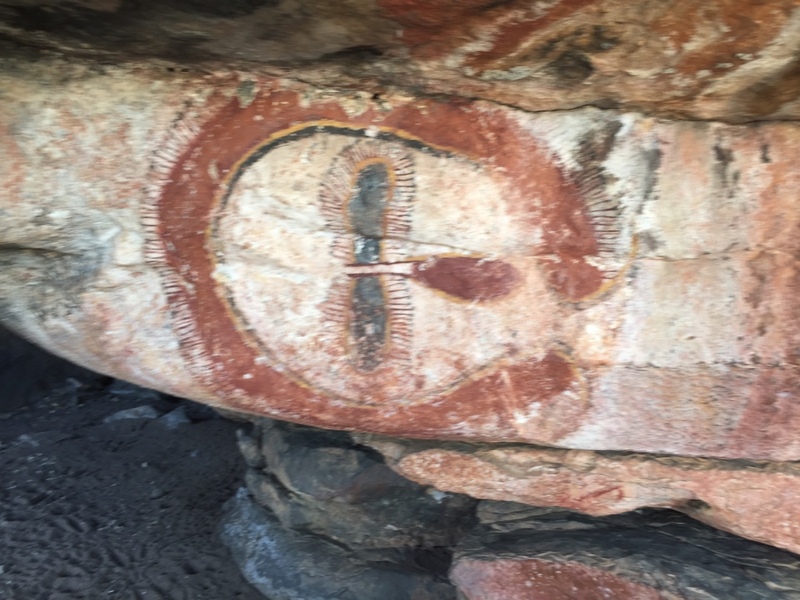 Here is a sign about the Wandjina spirits and their meaning to the local indigenous Ngarinyin People – this is similar to many clans across the Kimberley region. 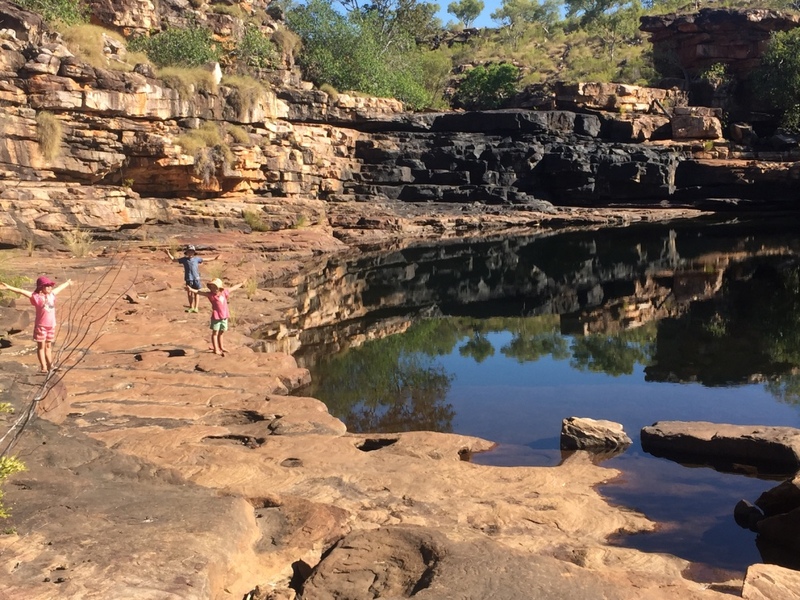 After lunch we were hot and ready for a swim without too much effort so we visited the nearby ‘rock holes’ after a short drive from camp we parked walked 25metres and arrived here….our own private oasis in the Kimberley’s. We had the whole area to ourselves..totally magic! 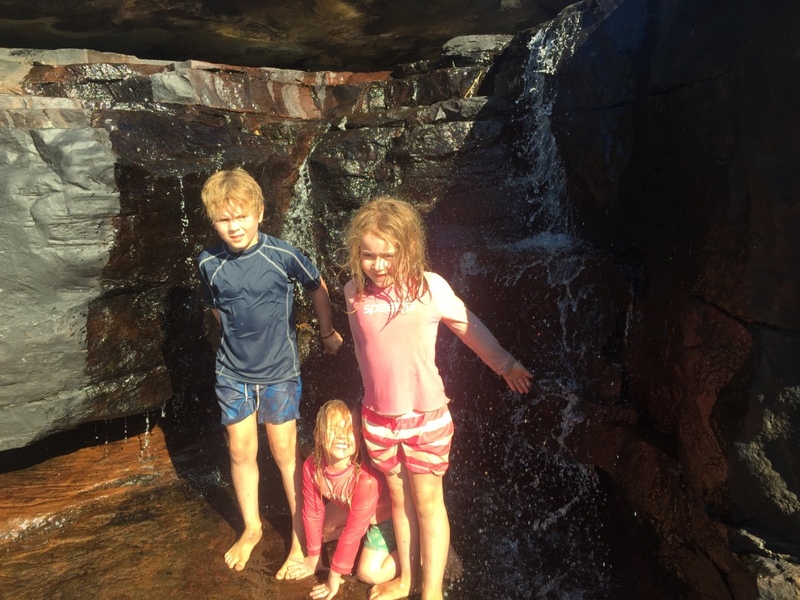 After a dip in the main pool we climbed up the dry waterfall and explored the upper pools. 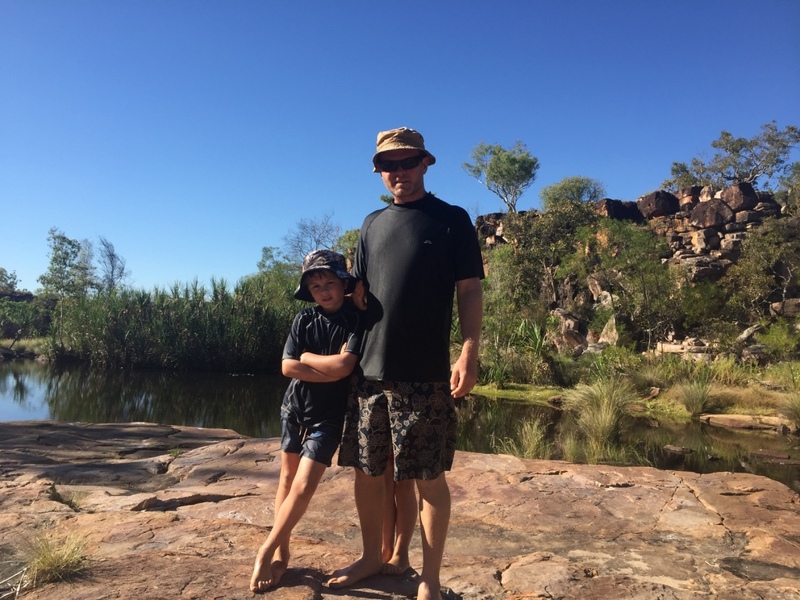 Aaron loved the rock climbing around whilst Andrew and I stayed close to the girls. Bianca was keen to follow Aaron wherever he went. We spent the most relaxing afternoon of the trip, swimming, reading and Andrew even had a bit of a snooze…tired after all the driving. 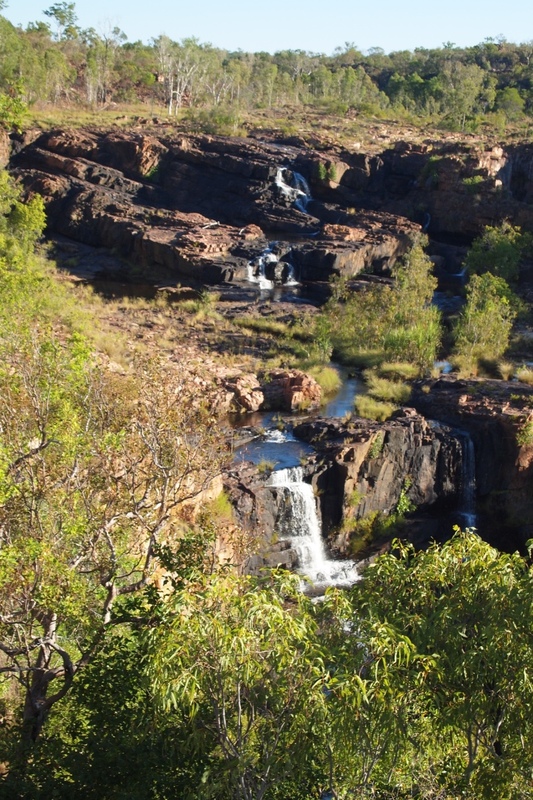 We all voted this as one of the best on the Gibb River Road mostly because it was our own exclusive swim hole. Amazing. 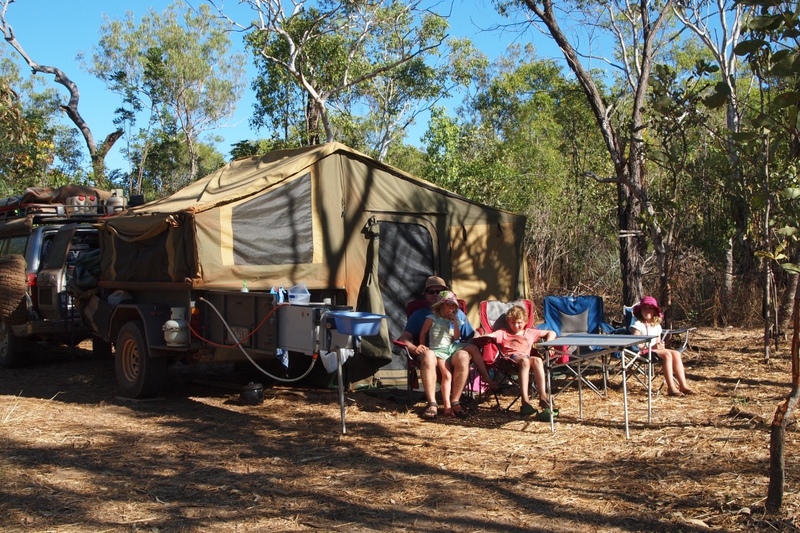 The camp ground was busier the second night with arrival of a large group but still not a problem with the bushy surrounds. 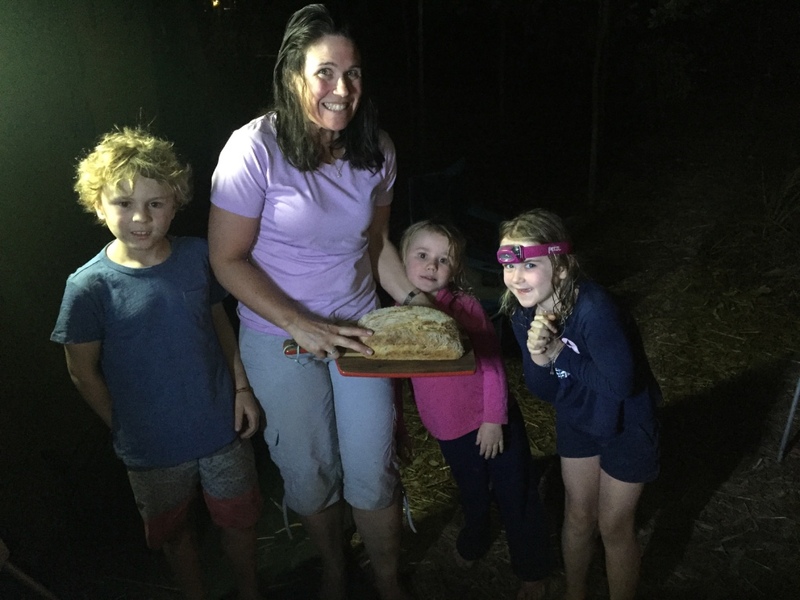 The children befriended our neighbours Peter and Linda and inundated them with non stop questions…about their camp equipment, their food and their bush walking adventures…anything. Andrew and I were a little worried that they might be annoying them but they assured us that it was okay.